Are security standards for electricity infrastructure a good choice for Europe? Evidence on cost and benefits from two case studies. Measuring the opening of national R&D programs: what indicators for what purposes? Gli esiti occupazionali delle Politiche formative in Piemonte. 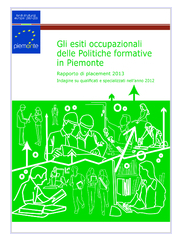 Rapporto annuale di Placement 2013.